As I mentioned in a post back in October, I did this Dark Phoenix PSC for Bob Almond and the Inkwell Awards. I did this at the Boston Comic Con and they're running the auctions now in a special "Sketch Card" grouping on Ebay in which this Dark Phoenix of mine is also available. 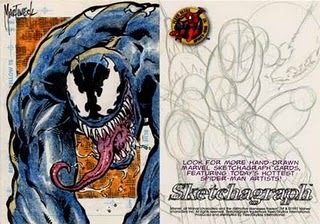 These auctions are set up to help raise funds for the Dave Simons Inkwell Memorial Scholarship to be awarded annually to the Joe Kubert School of Cartoon and Graphic Art. Being an XQB myself, (ex-Kubert Student) how could I say no to helping out. Many more details are found in the auction so go over and check it out. Also, I'm not sure when I'll be reopening my commissions list so here's a great way to get one of my PSC's without waiting too long. On a separate note, this is sure to be that last post of 2009. Ahhh, Casual Friday. If I wore a tie I'd have taken it off already. It has been a long week and desperate times call for desperate measures. To keep my head from rolling all around in a perpetual state trying to avoid falling asleep at my table, I through a shot of 5-Hour Energy in a Diet Coke and had at it. Sometimes chemical happiness is a necessity. So I'm sitting here at my table, drawing up today's CF piece, and thinking the original idea of keeping these restricted to 1-2 hours a piece is a bit inhibiting. Especially if I can spare some extra time and I really get into a drawing as some of the past pieces I find a bit... I think "rushed" would be a good word. So from now on, I will put as much time into CF's as I can spare. Todays piece is one I've been wanted to draw for awhile. As cool as so much was on Battlestar Galactica I thought The new Raiders were beyond cool. The lines and design is stellar. I could draw that fighter all day long. I've started posting more auctions lately and plan to keep it up. It'll be a great chance for fans to get some rare sketches and for me to finally make some money directly for myself instead of it all going to the companies or everyone else but me. ...and here's a pic for the Blog. One of the sets I've been working on lately that I haven't been able to talk about has been the Justice League of America set. I finished up my cards for this a few weeks ago and did 2oo for the set, which I've been told have all been approved. You can see one of the Hawkman I did in the ad below. I normally try to keep my numbers to 150 sketches or less per set (especially for all full color cards) but I thought I'd try a 3 card puzzle, something like I did with the Xena card set back in 2004. 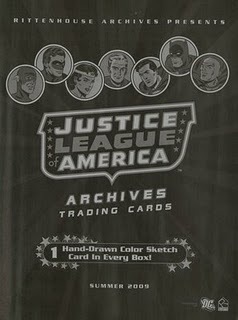 The JLA version will be a full color 14 member team shot across 3 cards. I made 9 sets of this puzzle to make it a bit easier to get one. That's the theory anyway. The ads have a release date of July but I haven't heard anything to confirm it. Also, yes, as far as I know I will be getting Artist's Proof for this set and will make them available. Speaking of which, I have my only X-men Origins - Wolverine Artist's Proof available right now on the Bay if anyone is interested. 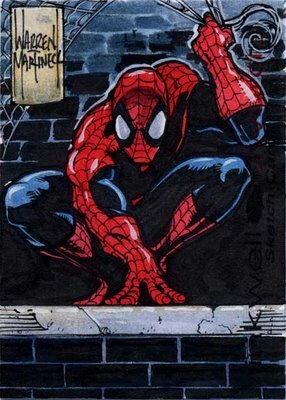 I just wanted to let anyone who may be interested know that this Spiderman Sketch Card is now available HERE. 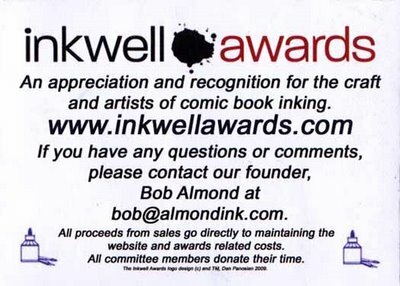 I was approached by Bob Almond, a good bud of mine, and he asked if I could do a quick sketch for him as a donation towards the Inkwell Awards. Ok, so it's not exactly a "quick" sketch but I don't even remember how to do one of those. Anyway, this was done on official Inkwell Awards card stock and is up for auction on Ebay and all proceeds go directly to the Inkwell Awards. Seeing as how I'm really booked up with work and not taking commissions at the moment, this would be a great ( and only) opportunity to nab a current and full color sketch of mine. Although I'm not running the auction, I'll probably be sending this out directly from here so maybe I'll stick a little something extra in the envelope. I'll have to see what I've got kicking around the studio. 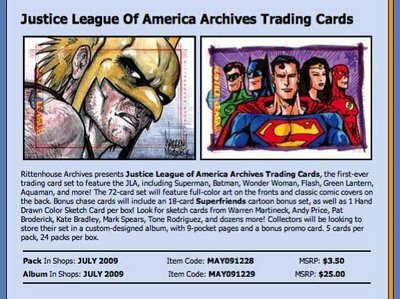 So stop by The Inkwell Awards Site and find out more about this card and the other auctions they have up and thanks for your time. 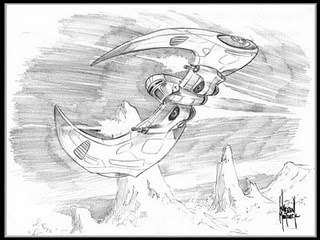 Here is a scan of the back of the card.